India has taken a historical decision of implementing GST into their taxation system, which will be under exercise from the next week. This is a very crucial moment for many business organizations in India to make themselves ready for this enormous change. If you are also one of those business owners who are looking to be prepared for GST, then this article will help you know what you are required to go in this last week. This is the most important step for any business company entitled to pay taxes on supplying of their goods and services in all the states. Every business firm is liable to be registered under GST laws and companies which are already registered with any existing law will be directly migrated to the GST regime. You can register for GST law for specific states from June 25. Make sure your IT system is ready to issue the GST invoice from the very first day of the GST regime, for which you will have to make all the arrangements in advance. Develop your invoice format with all the necessary fields before the exercising of GST in India. Furthermore, as per the requirements of the GSTIN, tax codes, conditions, and custom related data needs to be configured and updated well in IT system, allowing the system to generate reports for GST. GST may be around in the world for quite some time now, however, it is still a new concept for Indians, thus you may be required to train your employees from IT department and stakeholders about the necessities of GST. Educate your vendors, distributors and other people concerned about the amendment of the law and its compliances. This would allow you to be on the good side of the law and compute your taxation in a proper and accurate manner. The GST regime will levy a new tax on the supply of goods and services along with the credit provisions. Moreover, an enterprise registered in different states will also be treated as a distinct entity for levy of GST. Thus, every transaction made by the company will be recognized differently, regardless of the fact whether GST is applicable or not, if you would finalize your tax positions well. In order to determine the tax, the transactions need to be determined and configured in the IT system. The entire business process of supply, manufacturing, and sales of goods and services will be affected greatly by the GST regime. It would be a wise move to make significant changes in your business processes to meet the requirements of the GST. 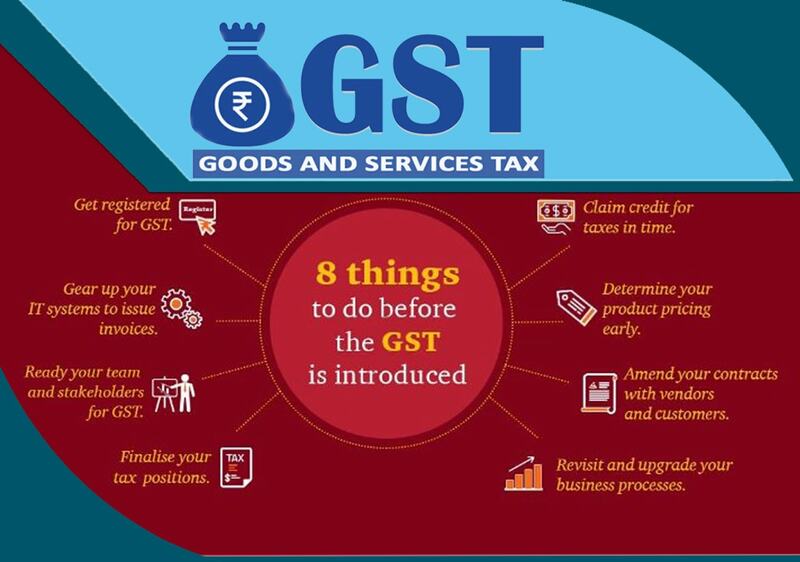 Know that when the GST regime will be applicable on goods and services, necessary arrangements and actions needs to be taken at different levels, such as self-invoicing for purchase made from unregistered vendors, reversal of credit for non-payment of consideration for goods, etc. In the soon to be previous tax regime, there was no requirement of receipt of input services or invoices at any given location in India. However, this won’t the case with GST regime and the business will be expected to provide an invoice receipt for goods and services at the place where they are credited. This would help with analysis of procurements of services and contract amendment with service providers. Furthermore, any contractual terms with customers will also be reassessed or revised. At present indirect tax regime, the supply chain partners such as retailers and distributors are liable to pay VAT on the sale price, which affects the price of the commodity due to their distinguished pricing. With GST regime, these chain partners will also be required to pay GST on the sales price, thus their margins will be recalculated due to alterations in tax rates and credit availability. Furthermore, the movement, tax credits and anti-profiteering provisions under GST will need the companies to reset their rates. Thus, it would be wiser for businesses to decide on the price of their goods and services well in advance by determining the impact of GST regime. The new tax regime will offer to carry forward of accumulated tax credit and be claiming credit for taxes paid on stock on hand. The taxpayers will need to submit their sales tax form or certificates in Form C, Form F, Form H, etc. for their history of claimed exemption or concessional rates of CST. However, such documents haven’t been submitted to the authority even now. Thus, it is urgent of you to speed up your form submission process so that you can later enjoy the benefit for claiming credits.